The National Retail Federation estimated that in 2017 shoppers spent 83.6 billion dollars on back-to-school shopping for primary and secondary schools, and another 54.1 billion on spending for college students. The average family spent just under $700. Before you start shopping, consider the following tips and tricks on how to save on your back-to-school shopping. Retailers are consistent with when they place orders for merchandise and when they begin marking down items. Understanding these retail trends can increase your savings. The beginning of the summer is the best time to buy laptops because new models come out in time for back-to-school promotions. You can also receive additional savings when bundling laptops with compatible printers. In the middle of the summer season, prices drop, making it one of the best times to buy clothing. Surprisingly, during late July and early August, summer clothes hit the clearance racks to make room for fall collections promoted during back-to-school sales. Consignment shop selection also increases as families clean out closets to make room for new purchases. The end of summer offers the biggest discounts on notebooks, backpacks, as well as school and dorm supplies. You will often find the biggest sales of the year and could benefit from buying enough supplies to last the school year. Is the best time to purchase a computer. The deepest discounts happen after school starts, just before new models come out for the Christmas holidays. There are short periods where sales on denim occur in preparation for the holiday shopping season. Winter and fall clothes also begin to see discounts. When you buy cold weather clothes closer to cooler temperatures, you pay less. Televisions and electronics are big draws for Black Friday sales. Scaled down models will offer the highest level of savings. Athletic equipment goes on sale. Retail stores know one of the most popular New Year’s resolutions is getting fit. Get your gear while it’s on sale. Unit pricing was put in place to help consumers compare prices. The unit measure summarizes differences in quantities and helps you determine the best price on different items. Almost all products provide a unit price. The product label provides the price, the weight, and in most cases, how much each ounce costs. With this data, you can cross compare. You must manually calculate the unit price on sale items to determine if the sale actually provides a better deal. For instance, crayons come in boxes of different quantities. The following chart is an example of how to find the lowest price, using the unit price of the item. In this example, Box of Crayons A is the cheapest. You can save money by comparing prices using the unit price. 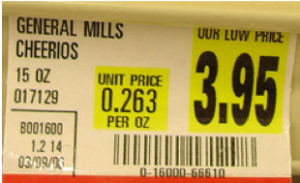 For the manual calculation, take the original (or sale) price and divide it by the number of items or ounces in the package, providing you with the true cost. Using this calculation can help you determine the savings from buying bulk, comparing items on sale or across brands. Sales tax holidays vary among states, with not all states participating. However, those that do, allow you to save up to 10% on the cost of qualified items by eliminating the sales tax. The benefit only applies to certain items, but generally covers, clothes, electronics, and school supplies. The following table provides the Sales Tax holidays for 2018. The five states charging the highest sales tax include, Louisiana at 10.02%, Tennessee at 9.46%, Arkansas at 9.41%, Washington at 9.18%, and Alabama at 9.10%. If you shop in Louisiana during the tax-free holiday and spend $2,500 on qualified items, you could save an additional $250.50, due to the 10.02% tax. Joining a store reward program and signing up for their email promotions can save you money. Email alerts can provide additional discounts and early shopping hours on sale days. Some companies also reward social media followers with deeper discounts and incentives. Joining your favorite store's reward program does not typically cost anything. You earn spending points, which allow you to receive “free money” once you reach the predetermined threshold. Points often expire. Therefore, use them within the allotted time. For larger items you need, consider creating a wish list for your extended family. A cousin may have recently graduated from college and no longer want the high-tech calculator or mini fridge you need. Friends and family also might have items they would love to donate. They can declutter and you receive items you would otherwise have to purchase.